This 15-year-old Japanese high school student – with a super-hip-right-now double bun hairstyle – is named Ozawa. We met her on the street in Harajuku. 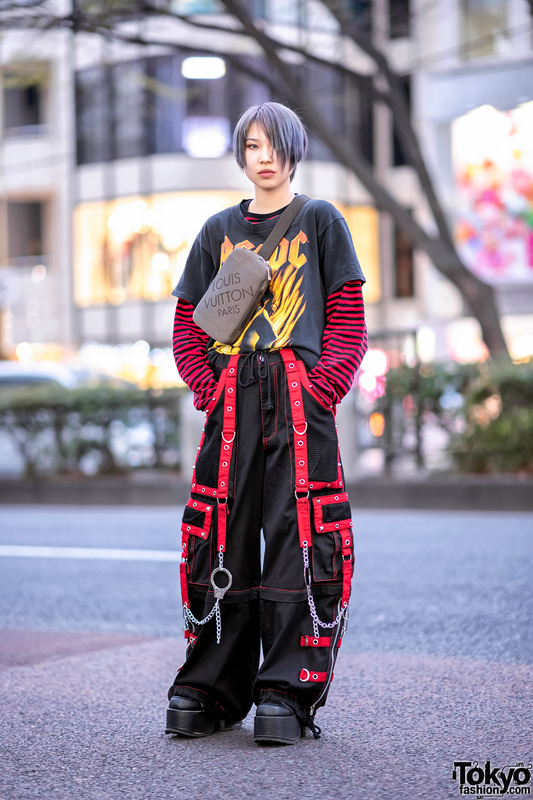 Ozawa is wearing an outfit that includes a denim jacket (with the tag “Bobson Kachh”) that she bought at a flea market, skull-print suspenders, a long handmade red sheer skirt over acid wash denim shorts, skeleton print tights, and a pair of the famous-in-Harajuku Nadia platform high-top Converse sneakers. 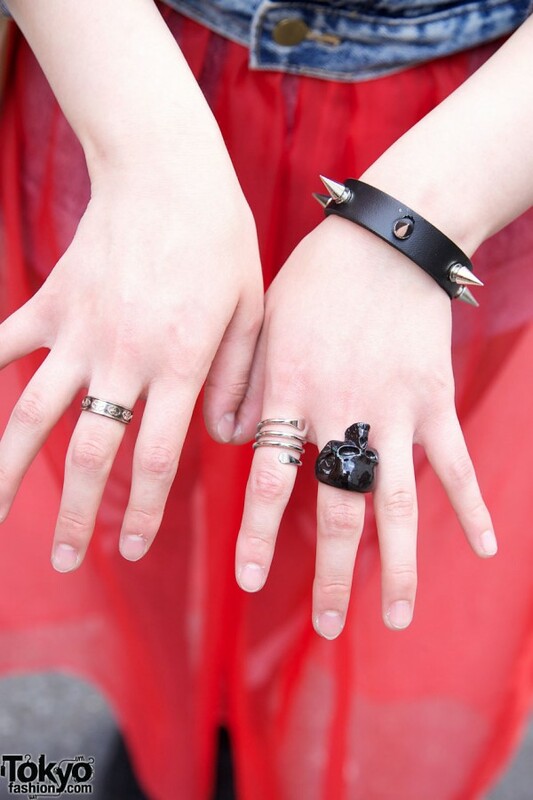 Her accessories include a red hair bow (that matches her red skirt), multiple earrings, round vintage-looking glasses, a spiked bracelet, a large skull ring, a spiral ring, and a metal ring that appears to have Toyota logos on it. She said that some of her accessories came from the Harajuku vintage shop G2? and others from the Japanese brand Monomania. 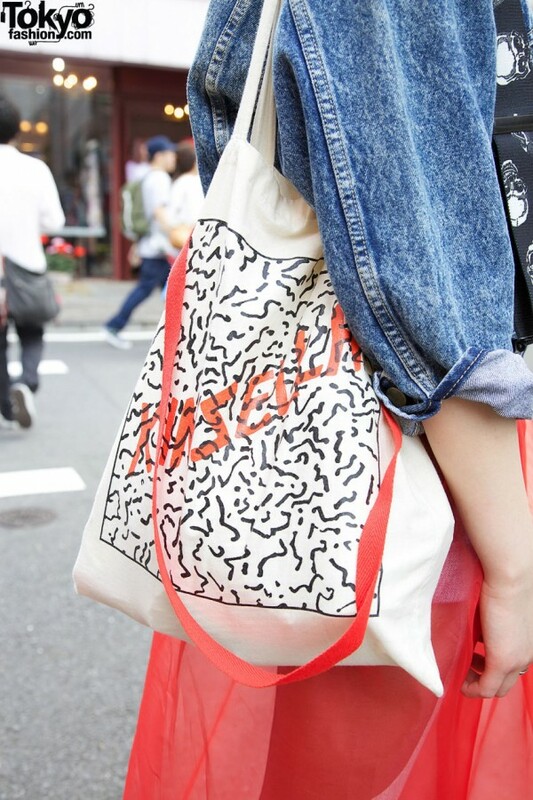 Her bag is from the well-known Harajuku resale shop Kinsella. Ozawa told us that her favorite shop is Harajuku’s own NADIA Flores En El Corazon (aka Nadia) and her favorite band is Bump of Chicken. I that Mao Tse tung in her earrings? What a cutey!! And so stylish!! …. <3 What a pretty gal!! WOW! She is so cool..Like the epitome of what Harajuku is all about right now. I love this style. The shorts with skeleton tights/sheer red skirt idea is brilliant!! red is a great color choice for anything denim! OMG this is soooooo CUTE! I love the way she combines the red transparent skirt with shorts and denim tights inside. Everything match with the skull suspender and accessories. And the round glasses, oh me want it so mucho! Shes got a very quirky style – I like!!! I wish I was this cool at 15 >< I want those converse so bad!